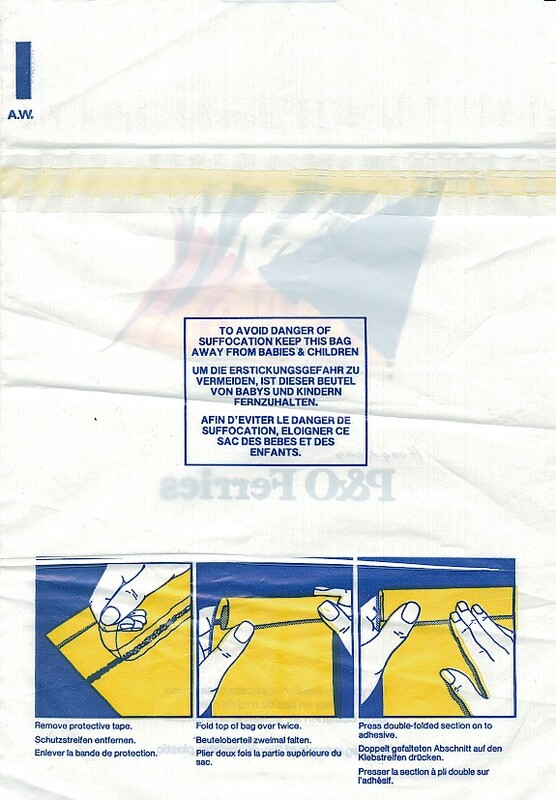 The instructions were eliminated, as was the airplane zipping across the bag. Much lamer bag than last year's. 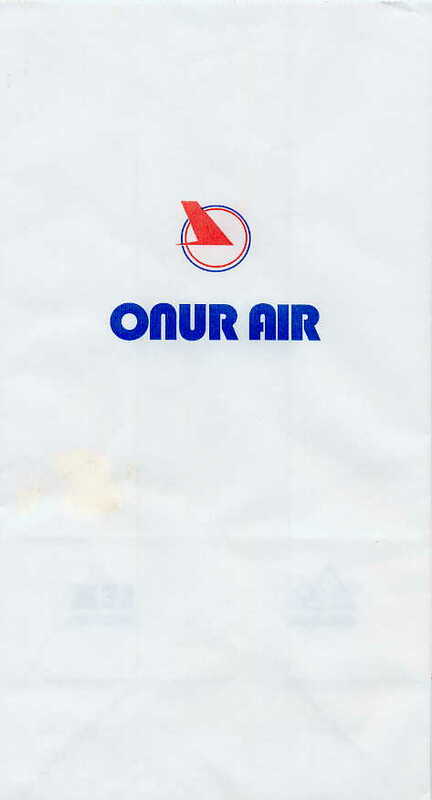 The 2nd offering from Onur Air in 2005. 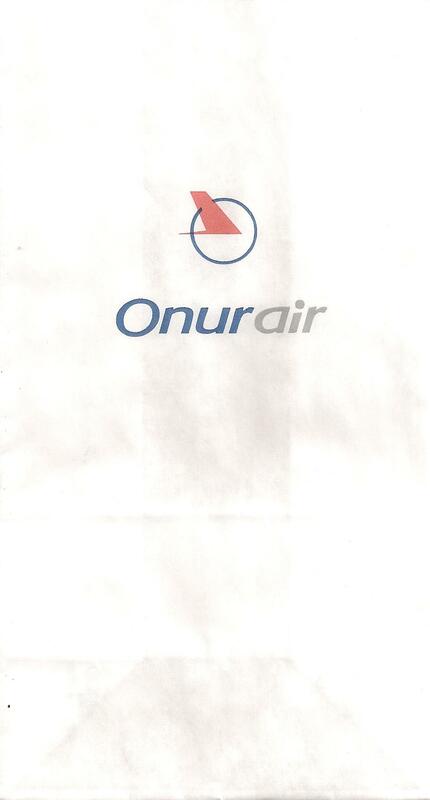 In this version, the logo is stacked on top of the airline name instead of next to it. 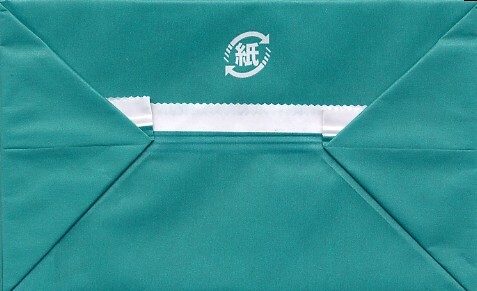 The manufacturer, SEM, is indicated in the gusset. This bag is enormous, allowing for copious volumes of sputum, however, it's awful flimsy. Interesting sun-dial logo so you can keep track of the hours as you fly. Although substantially the same as previous bags, they decided to add gray to the bag as a way of making it more colorful, I guess. 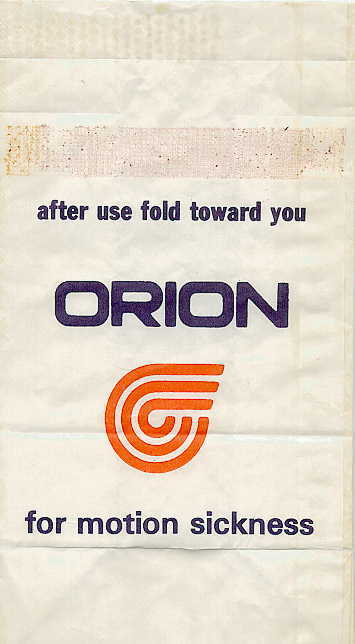 Cool bag from Orbest when they were run by the now-defunct Orizonia Group. 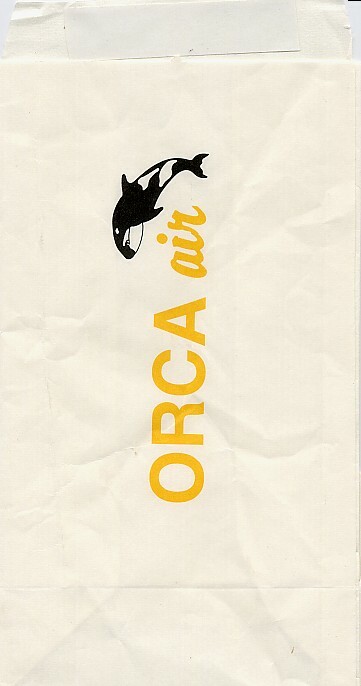 The airline only has 4 planes yet still find the life force to come up with cool barfbags. Despite the Philadelphi Flyers logo and lack of constellation, this bag is actually laid out pretty well. 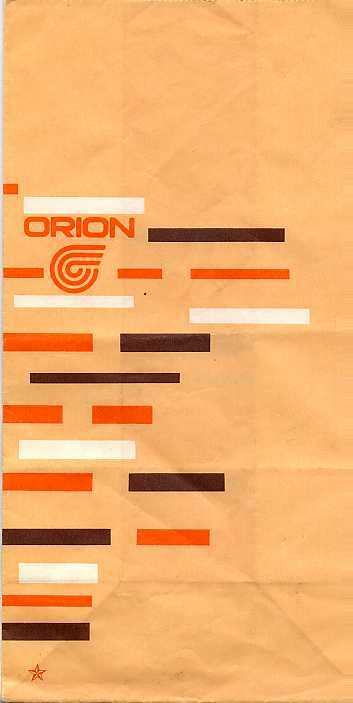 Now here's a bag that screams '70s kitchen design'. 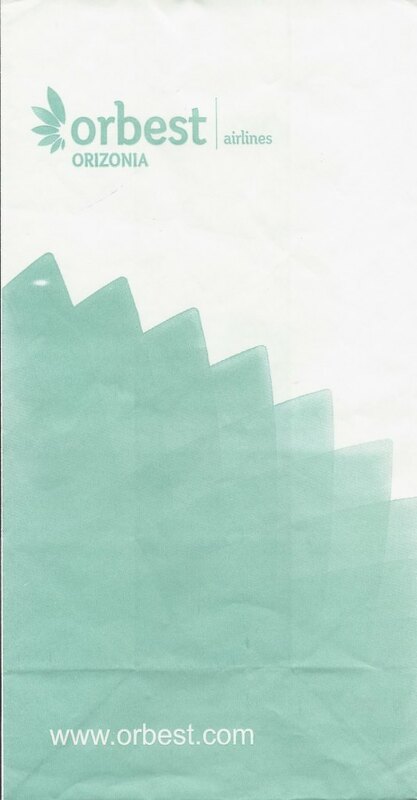 I'll bet some designer got paid to slap down 21 rectangles and a Philadelphia Flyer's logo. What a great bag. 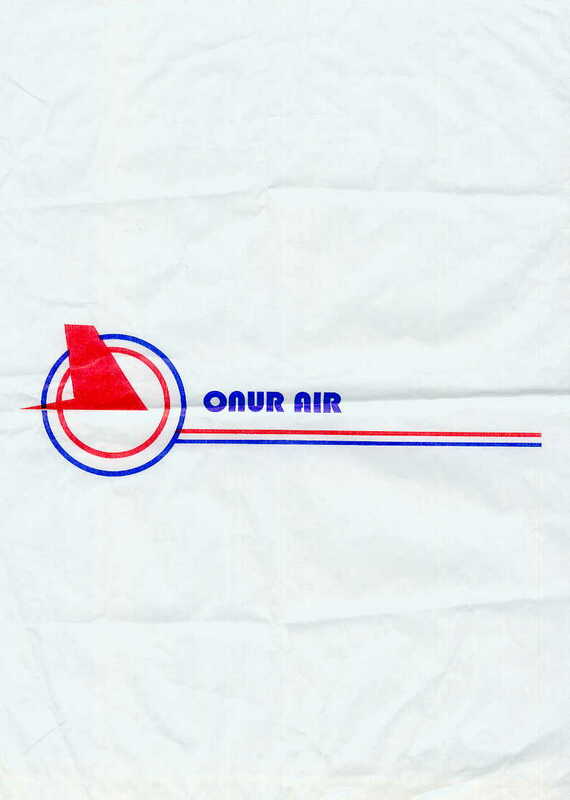 The logo looks like a cross between a Circle K Food Store and a diode. 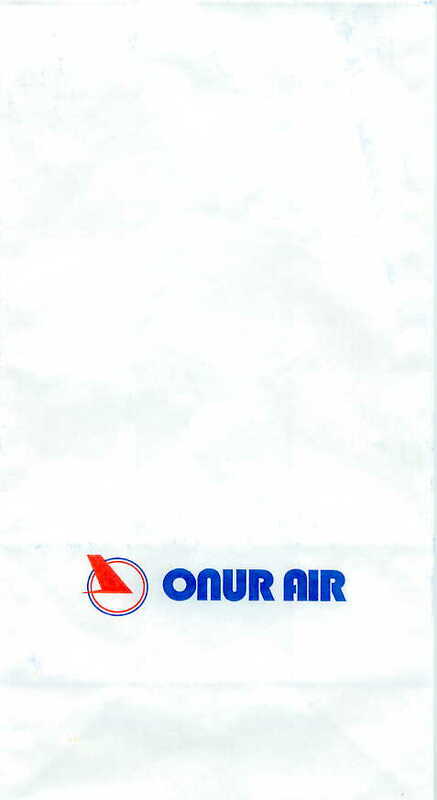 One of the very few car sickness bags out there. 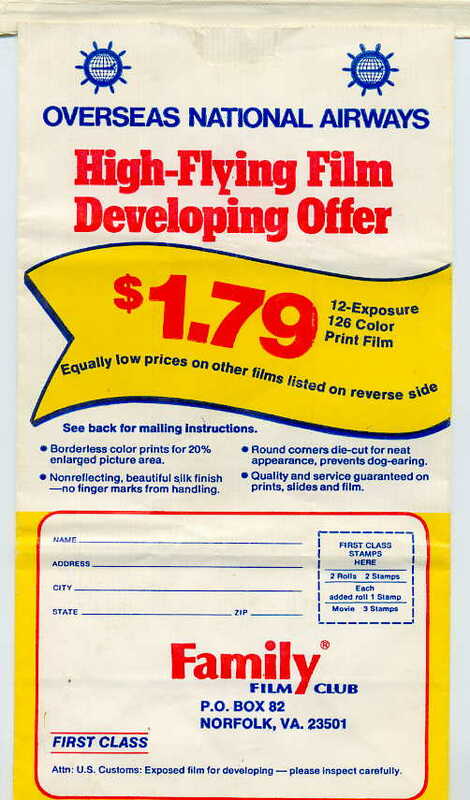 Excellent Photobag from a long time ago. 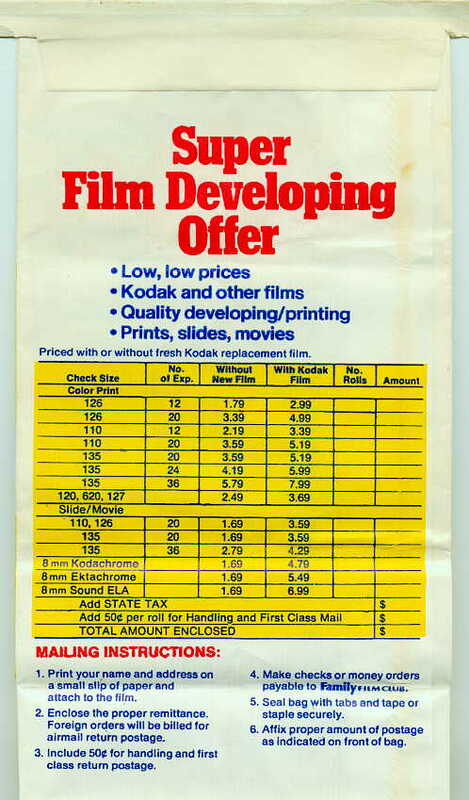 Remember when you would buy film with only 12 exposures on it? Now, most digital cameras sold without memory come with that much storage. 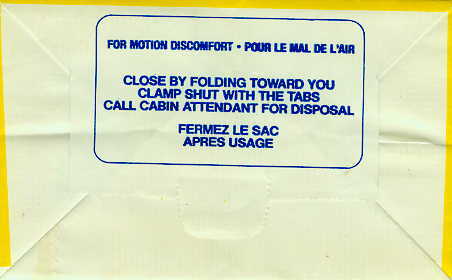 Oddly enough, the entire bag is in English except for a few French phrases on the bottom. 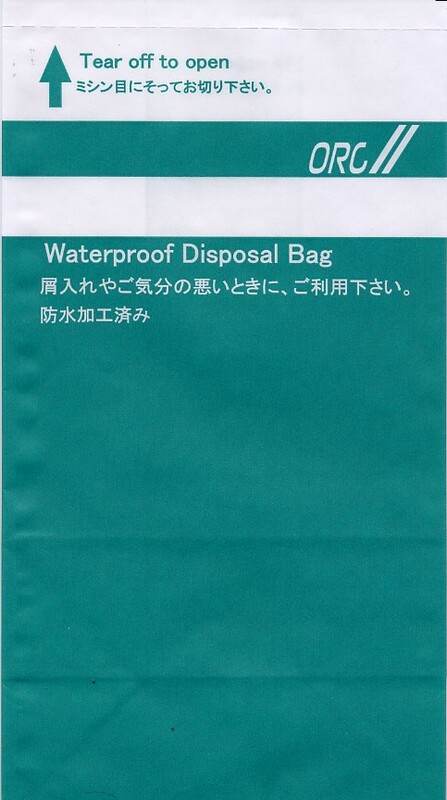 A huge and beautiful bag because of all the halftone colors on the waving flag. 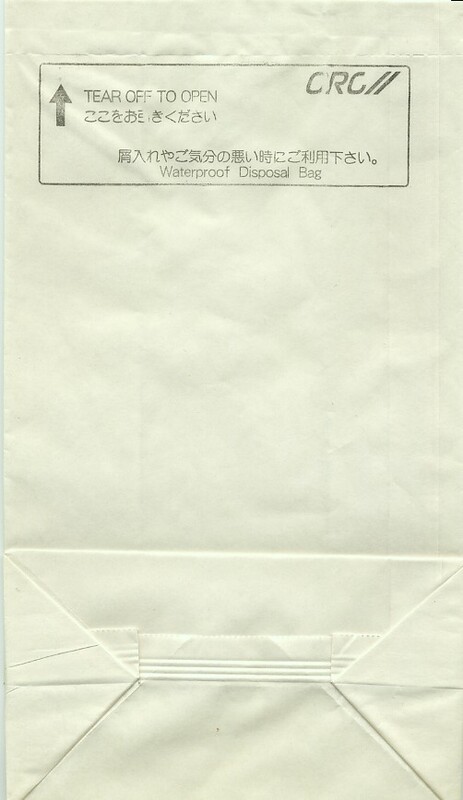 Plus, they call this a "Dispobag". I think "Discobag" would have been a lot more descriptive. 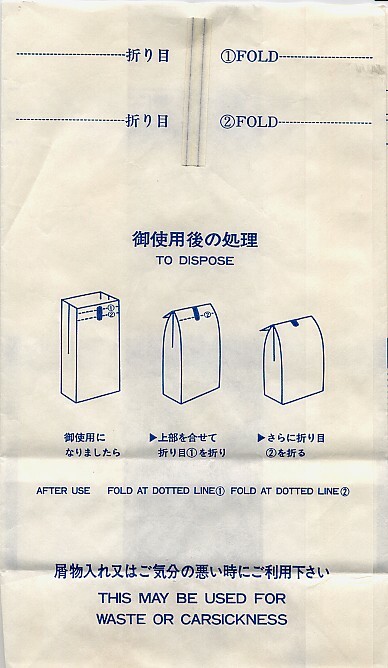 To give you an idea of just how large this bag is, there are instructions on how not to suffocate while using this bag. This means that someone's head could potentially fit inside it. Can you imaging throwing up that much food? 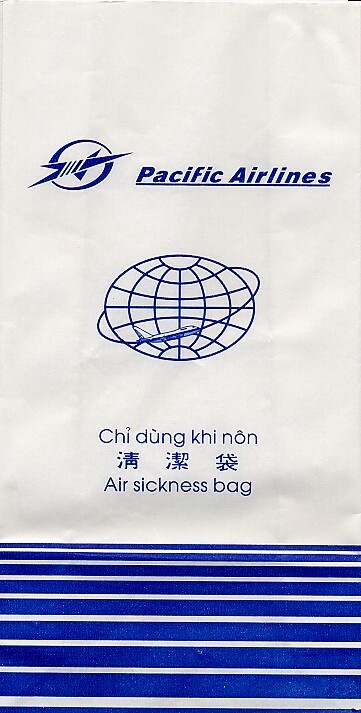 This bag is not just a bus sickness bag per se (even though it says it's for travel sickness). It's seems to be mainly for trash. 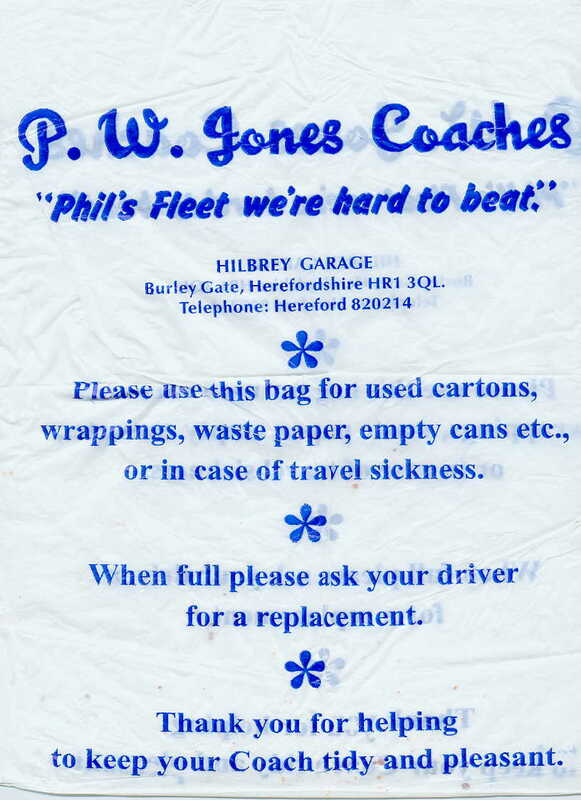 Just remember to recite the "Phil's Fleet we're hard to beat" mantra while you're puking. 195 poppies grace this bag, but even if they're Wizard of Oz magic poppies, you won't fall asleep in this Indonesian carrier's clattering fuselage. Nice suggestive world map that looks like a size D bra. 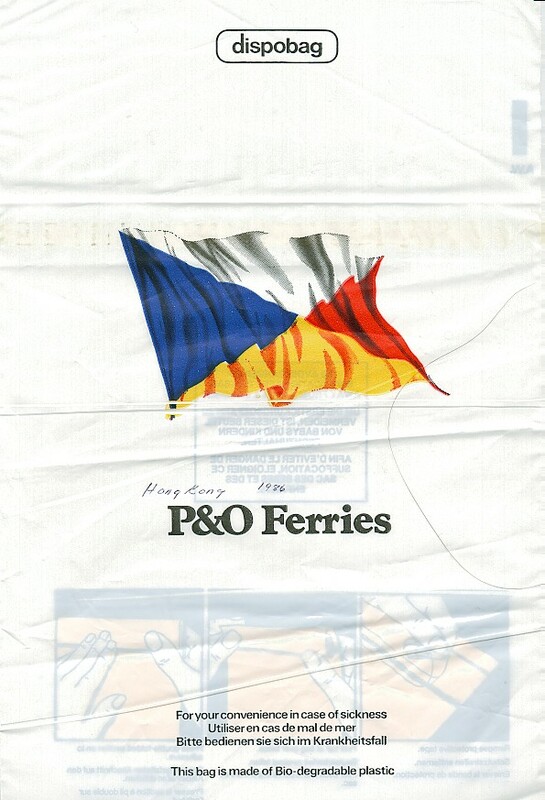 Features an airplane orbiting the globe in a fixed path never seeming to land. 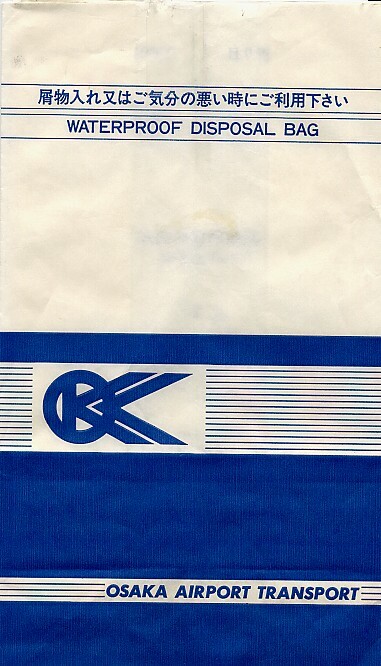 Britannia-like blue lines printed on the bag's bottom. Also has a circled italicized striped star designed by someone who spent too much time doodling. This two tailed lion with a crown is oddly reminiscent of the cowardly lion in the Wizard of Oz saying, "Put 'em up". This bag looks familiar -- almost like an old Delta or something, but it's not. 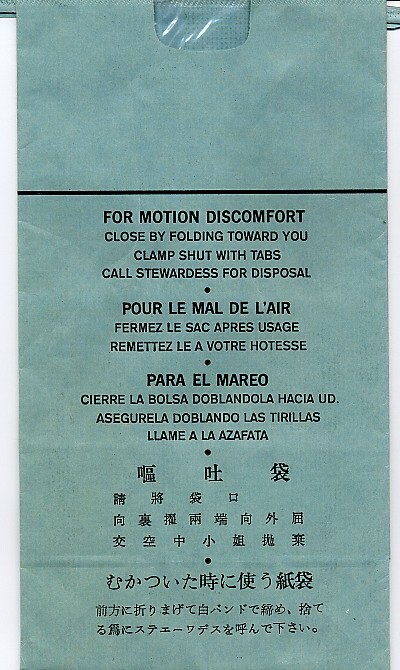 Has 5 languages, and nice clean-cut wording. Well for once I was able to ID the bag myself. 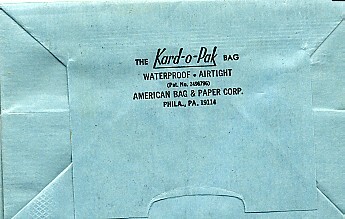 If you examine the other old Pan Am on this site, you can verify that this bag is its predecessor. This is from back in the 60's, I have to believe. 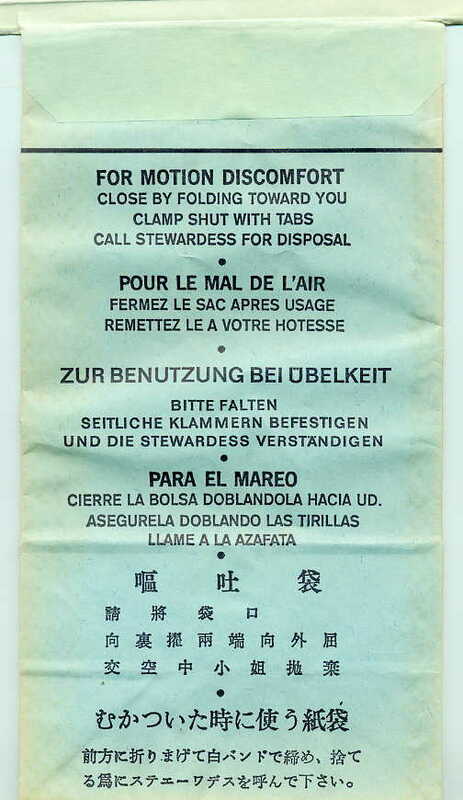 Looks like sometime in the 60s, Pan Am decided to add German to this bag. 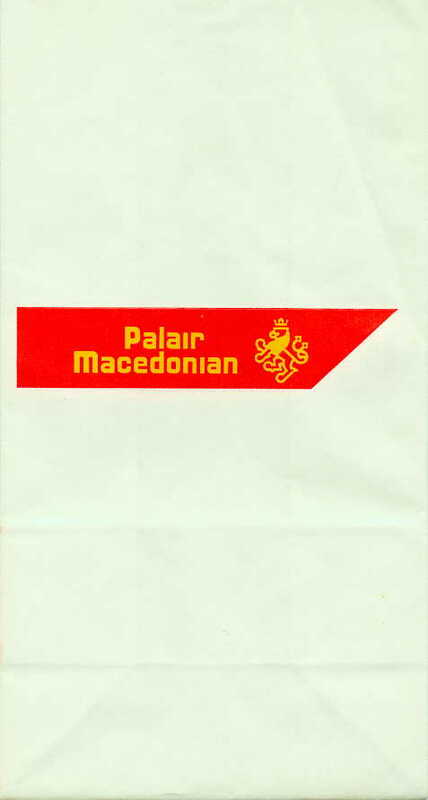 This old specimen has the Pan Am logo on the bottom, which I found to be not only attractive, but instructive in identifying an even older Pan Am bag, pre-German instructions, that no one had any idea what it was.